Countries with an edge in the Smart City domain, including South Korea, Germany and Singapore, have assured full support and cooperation in implementing the smart city projects in Jabalpur. Third-largest city in the State of Madhya Pradesh, Jabalpur achieved the distinction of featuring at the 7th position in the Government of India’s first list of 20 cities to be developed into smart cities. On 26th May 2016, the city had an opportunity to witness and listen to the smart city domain experts. The Smart City Conclave-Jabalpur, organised by Elets Technomedia Pvt Ltd and co-hosted by Jabalpur Smart City Pvt Ltd, saw the participation of smart city experts from India and abroad, foreign delegates, government officials and private stakeholders. A detailed discussion and deliberations on the opportunities and challenges in making Jabalpur a smart city was the highlight of the event. Separate deliberations also took place on the Garment and Tourism sector of Jabalpur. The local administration in Jabalpur has also been giving much attention to the promotion and making Jabalpur a Tourism and Garment hub. Jabalpur has witnessed a phenomenal growth in garment manufacturing during the past decade. At present, more than 50,000 skilled workers are employed in this sector. The sector can be given further boost by developing forward and backward linkages using IT solutions. In this context, the National Skill Development Corporation (NSDC) has played a crucial role by extending its help in grooming the local manpower into a skilled workforce. “We are ready to work in association with the Jabalpur Municipal Corporation,” said Jaikant Singh, Head, Partnership & State Alliance of NSDC, speaking on the occasion. The day-long event held in Hotel Gulzar had six different sessions to explore the opportunities and challenges of raising a smart city. Inaugurated by Jabalpur Mayor Dr Swati Sadanand Godbole, the event also had the presence of Padma Bhushan awardee and Founder of Sulabh International Dr Bindeswar Pathak. Godbole, in her speech, appealed to the smart city experts and investors to come to Jabalpur. “Our administration will extend all possible help to the people coming to Jabalpur. Let’s join hands to make Jabalpur a real smart city,” she said. Highlighting the issue of hygiene, Dr Bindeshwar Pathak in his remarks said open defecation should be stopped completely. He also informed about the efforts being made by the Sulabh International in the field of sanitation. Sulabh has the technique to purify water at Rs 1 per litre and can use the same for drinking purpose, Dr Pathak informed. The Padma Bhusan awardee also shed light on cultural values and cleanliness Sulabh teaches its students at Sulabh International schools. He assured of all required support, if such an initiative is undertaken in the schools of Jabalpur. Sanjay Paranjape, who represented the German consortium at the event, said that Jabalpur has big potential for investment. “The German consortium would like to work in cooperation with the Jabalpur administration,” he said. The smart city experts present on the occasion said that Jabalpur can’t be made smart only by providing residential facilities or improving the same, but the city must have job opportunities, too. They were unanimous in their view that Jabalpur has immense potential to become a truly smart city. Sanjay Nagrekar, an NRI based in Hong Kong, said that he has computed the details about smart city in Dubai and Korea. “Facilities for overall development and uplift of living standards can give birth to many smart cities,” said Nagrekar. Piyush Tiwari, Director (Commercial & Marketing), India Tourism Development Corporation (ITDC), said that all existing possibilities of tourism should be exploited to the fullest to develop tourism in Jabalpur. “Jabalpur has good tourism potential. We need to explore it in a strategic and planned manner,” said Tiwari. He emphasised that public places like railway stations, bus stands, hotels, etc., must have display boards giving information about tourists spots. Echoing the view, Principal Director, Natural Heritage Division of INTACH, Manu Bhatnagar, said Jabalpur has good natural heritage and it must be preserved. “We at INTACH would extend all possible efforts to protect and preserve the natural heritage of this beautiful city (Jabalpur),” said Bhatnagar. Experts speaking on the occasion expressed their views on the conservation of water bodies, greenery, development of religious tourism, public safety, pollution, education, medical and various techniques. Jabalpur Municipal Corporation Commissioner Ved Prakash, who is leading the smart city mission in Jabalpur, said that the real stakeholders of development are the people of the city. “This event, we hope, would definitely give us a major push towards implementing the smart city project,” he said. Prakash emphasised the need to strengthen the public transport system of Jabalpur. “We are also trying to shift from motorised to non-motorised system of vehicles to make the city safe and environment friendly,” the Commissioner said. Dignitaries, including District Magistrate Mahesh Chandra Chowdhary, Superintendent of Police D Ashish, Sumit Chowdhury, Kiran Joshi, MLAs Susheel Tiwari and Ashok Rohani, JMC Chairperson Sumitra Balmeek, Mayor-in-Council members Kamlesh Agarwal, Shriram Shukla, Rekha Singh Thakur, Naveen Kumar and Ramesh Prajapati, among others graced the occasion. The success of the event could be gauged by the fact that a day after the conclave, smart city solution providers and investors had one-to-one in-camera meetings with Commissioner Ved Prakash and CEO-SPV (Jabalpur) Gajendra Singh Nagesh. 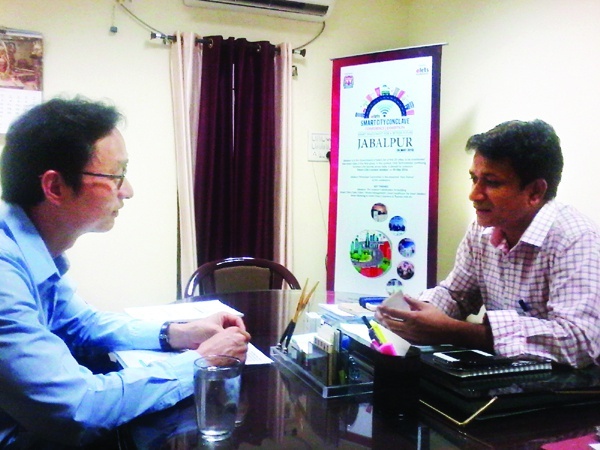 “We are ready to provide our help in developing Jabalpur a smart city,” said Tony S. Jun, Project Advisor, Overseas Project Development, Seoul Urban Solution Agency, South Korea. The event organiser, Elets Technomedia Pvt Ltd, is Asia’s premier institute dealing with eGovernance while taking ahead the Government of India’s Smart Cities Mission. “We have decided to organise similar conclaves in all the 100 cities in the near future. We don’t only organise conclaves, we also work as a facilitator between the government and private stakeholders in the domain of smart city,” said Dr Ravi Gupta, CEO, Elets Technomedia Pvt Ltd. In line with its commitment, on June 10-11, Elets Technomedia is organising “Goa Knowledge Exchange” summit in Goa on the theme “Smart Cities in the Era of Digital India”. Similarly, on June 17-18, Elets Technomedia is organising “Smart City Summit” in association with the Kalyan-Dombivli Municipal Corporation.